This painting was originally shown in 1974 under an alternate title: Death and The Three Graces, for the Greek goddesses of beauty, charm, and joy. The painting was taken to the Royal Academy’s Summer Exhibition in 1975. The image is overloaded with allegorical associations, including Beauty and Decay, Fool Symbolism, and The Three Fates. However, the quotation of the painting itself within the painting creates the sense of a doppelganger, or double, an uncanny portent of bad luck in German folk-lore. In the Greek myth, Eris, the goddess of discord, intrudes upon a banquet where Hera, Athena and Aphrodite are present. She brings with her a golden apple inscribed ‘For the fairest one’. Zeus, asked to judge which goddess is fairest, instead delegates the task to the mortal, Paris, son of the Trojan king, Priam. Each goddess offers inducements to Paris to select them; Aphrodite’s being the promise that Paris would possess the most beautiful woman in the world, Helen. Thus, Aphrodite’s gift to Paris results in the destruction of Troy. 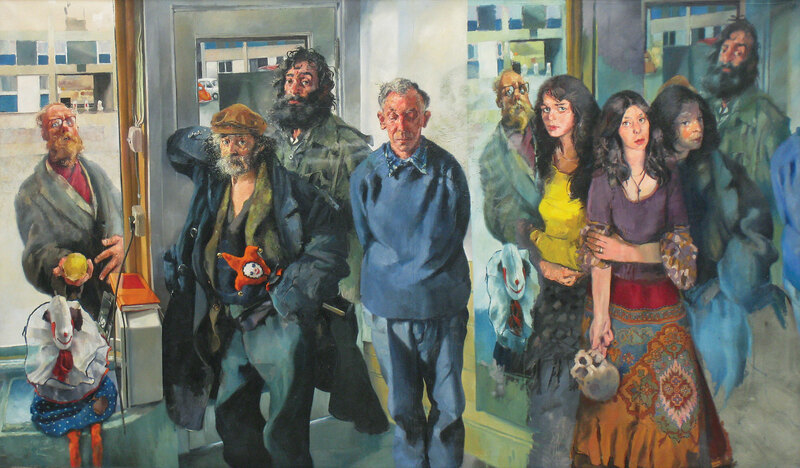 The sitters include (left to right) the vagrant Albert Fisher aka ‘Bishop’ [holding a Golden Delicious apple]; Edwin Mackenzie aka ‘Diogenes’; the bearded Terry Goldstone, a political activist and sometime rough sleeper; Pat Parker; and Monica Quirk.